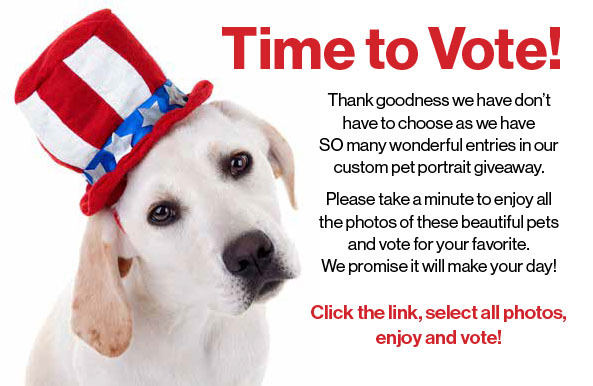 Please take a minute, click the link and vote in our Pet Portrait giveaway. Only 6 votes separate first and second place! It is appropriate in this week of celestial wonder that Todd’s latest portrait is the lovely Luna, shining brightly for all of us here on earth. Freddie’s ready to beat the heat! 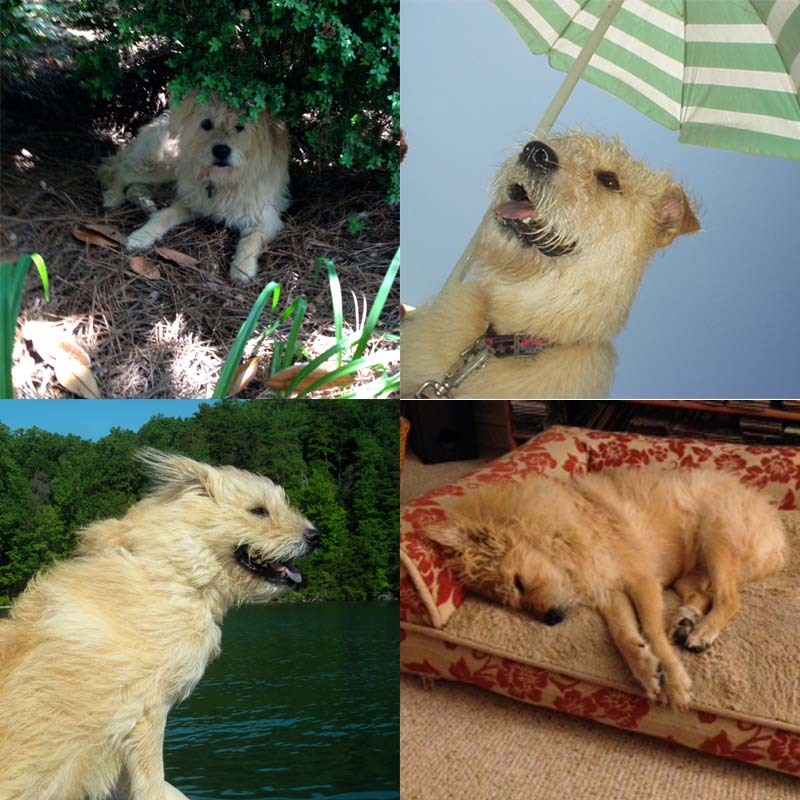 Summertime and the livin’ is easy—especially if you are our Freddie girl, who makes the most of every season. But with summer temps in North Carolina routinely in the 90s—and humidity making it feel like it’s over 100—even Freddie is wilting a bit. She spent a recent afternoon in the air conditioning pulling together a list of ways she and her pals stay cool in the summer. She wanted to share them here with all her dog followers. I love summertime! It’s one of my top four favorite seasons. Barbecues with friends (and sneaking bits of barbecued meats under the table), days spent at the lake, nights sleeping under the stars. I think you’ll agree it’s a good time of year if you’re a dog. Only problem: Summer gets a little warm. And this year seems especially hot. My people—Stephanie and Todd, the best people ever—tell me it was still 85 degrees at 10:30 last night. I wouldn’t know anything about that because, at that point, I had been sleeping comfortably in the air conditioned house for several hours, but I agree that kind of heat is excessive. 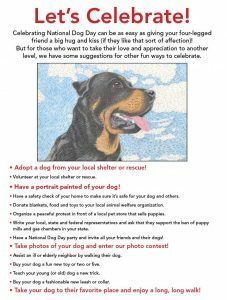 I have to be especially careful in the summer because older dogs are less heat tolerant and, at age 14.5, I’m very much a senior dog. But when temperatures get into the 90s and 100s, dogs of any age—even puppies—are at risk of heatstroke. 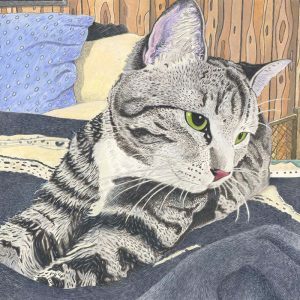 I had my assistant (the woman who helps me type up my thoughts into these blogs) look up the signs of heatstroke on the computer machine and they don’t sound fun at all: heavy panting or drooling, trouble breathing, rapid heartbeat, dark red gums and tongue, dizziness, weakness and agitation. If you are showing signs of heatstroke, your people must take you to the vet right away—and nothing ruins a summer day faster than an emergency trip to the vet. Although, it’s already August there are plenty of scorching days left. So, to help my canine pals, I’ve pulled together some tips to beat the heat. * Hydrate! Hydrate! Hydrate! To keep the water cool and refreshing, ask your person to add ice cubes to all your water bowls. A little drink umbrella is a nice touch, but obviously not required—unless you’re a poodle or a shih tzu. If plain water isn’t your thing, request a little unsalted beef or chicken broth be added. Yum! When it’s really hot, none of us wants to exert a lot of energy and that includes getting up from a nap in the bedroom to walk all the way to the kitchen for a sip. Again, ask your people for an accommodation—an extra water bowl in the room where you spend most of your time makes staying hydrated so much easier. My pal Clooney suggested a second water bowl upstairs and now it’s his favorite place to grab a drink. * Adjust your walking schedule and route. As I’ve gotten older, Todd and I have broken my one long daily walk into two shorter walks, and in the summer we take those walks early in the morning and late in the evening. Remind your people that, while our doggy paws are tough, if the pavement is too hot for their bare feet, it’s too hot for our toes, too! If your usual walking route is pavement, change to a shady park or natural area, where you can walk—and roll around—in the grass — one of my personal favorites. Or, if you like to make a fashion statement, get a pair of doggy booties. Cute and practical. * Cool down quickly. After a walk or following playtime in the yard, lie on a wet towel in the kitchen or bathroom or request for a cooling spritz of water on your tummy. Refreshing! Your people also can swipe your paws with a bit of rubbing alcohol for a quick cool down. It’s not my thing, but you might like it. To keep you comfortable during naptime, try a cooling gel pad or elevated dog bed, which allows air to circulate underneath you. Both products are especially nice if you like sleeping outdoors. Although honestly, if I’m going to nap outside, I prefer a shady hole. Right now my favorite is a deep one by the patio that my brother Joey excavated a couple of years ago. 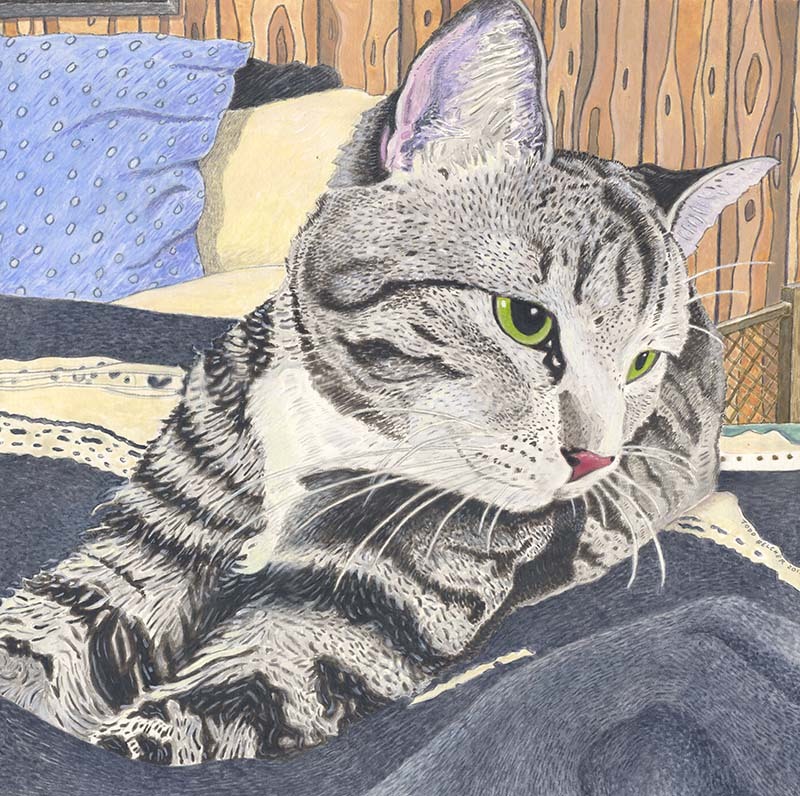 I crawl into it and dream about all the good times he and I had before he crossed the Rainbow Bridge. 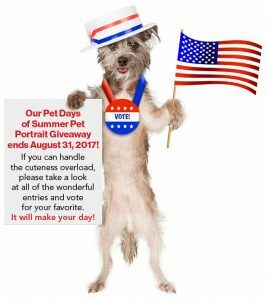 If you spend part of your days in a crate (I’m thinking of my young pup friends) or in a dog house, you know how stuffy they can get. Make sure your people invest in a fan to keep the air circulating. * Plan an alternative outing. As much as I love to walk, I have to admit that some days it’s much too hot. On blistering days, Todd and I just go for a drive with the AC blasting. It gets us out of the house and gives us time together. Of course, he never leaves me in a hot car: If we make a stop, I tag along. I also like to join Stephanie and Todd on a summer evening out. Many restaurants invite dogs to dine on the patio. (I still don’t understand why I can’t go inside. I have excellent table manners.) When we go to dinner, Stephanie and Todd bring some of my favorite treats for me to snack on while they eat their people food and then I take a quick post-meal nap while they chat about their days. It’s perfect. * Indulge in tasty treats. I enjoy the occasional Frosty Paws, a yummy frozen dessert just for dogs. My pal Clooney’s mom makes him a homemade version, mixing 1 cup low-fat plain yogurt with 1 cup peanut butter and a little bit of honey and then freezing the mixture in ice cube trays. Clooney gives them two paws up and I have to trust his review because so far, he’s never shared them with me. A Kong filled with peanut butter and chilled in the refrigerator or freezer is another delicious summer snack. If you’re watching your weight and avoiding treats, ask your people to put your favorite chew toys in the freezer. Invigorating! * Go for a swim. Some of my dog friends—and my very famous porcine pal Esther the Wonder Pig—rave about having a small plastic pool they can splash around in. As you know, I’m more of a lake girl myself and love to get out on the water with Todd and our friends Bryan, Amos and Piper. Bryan pilots the boat while Amos, Piper and I navigate and keep an eye out for the fish in the way that only dogs can. If you’re going to spend a lot of time in the water, invest in a good safety jacket. That way, when you get tired of dog paddling, you can just float for a bit. (You’ll also look stylish!) If swimming isn’t for you but you like water, try a sprinkler or mister in the back yard. Finally, when it’s simply too hot to do much of anything, I advise a long nap. And speaking of naps, I’m pretty sure I feel one coming on. Need something to brighten your day? 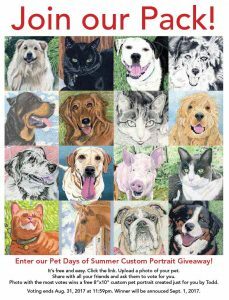 Please take a minute to take a look at all the great photos entered in our pet portrait giveaway. Wonderful photos of beloved pets. We’ve got a good battle going on for first place. Click the link, select all photos and vote for your favorite. 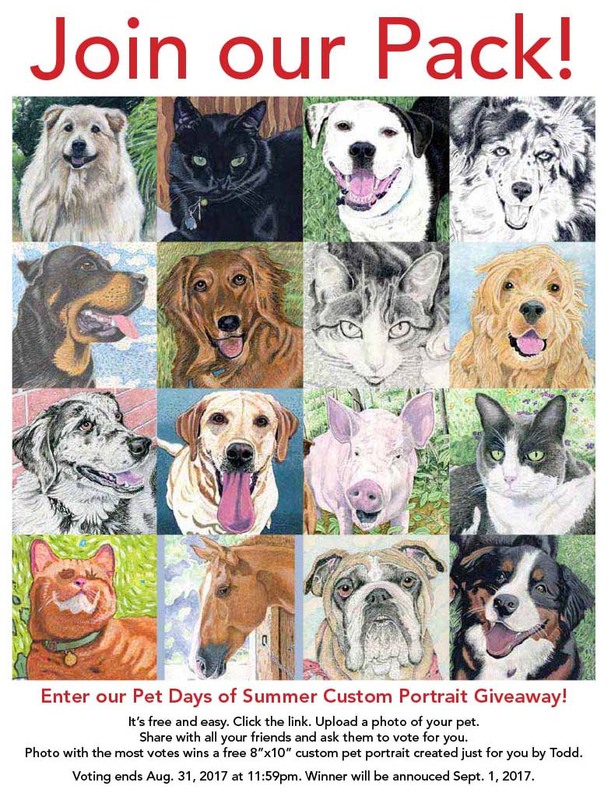 Our Pet Days of Summer Custom Portrait Giveaway is off to a great start. Thank you so much to all who’ve entered so far, so many wonderful photos. Don’t forget to keep sharing your entry with all your friends. There’s still plenty of time to enter and we hope everyone will take a minute, enjoy the photos and vote for your favorite. Click the link to get to the contest page. Meet Marvelous Mosey. 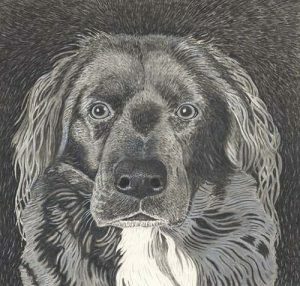 Todd’s latest portrait was the perfect 50th birthday gift.